The 24th annual South African Sociological Association (SASA) congress kicked off on a high note at the North-West University’s (NWU’s) campus in Mahikeng with throngs of domestic and international delegates attending. Under the theme #WhatMustRise, SASA President, Dr Sonwabile Mnwana, gave a brief interpretation of what the topic requires from delegates. He also talked about the forgotten role of the rural community activist who is always excluded in the national discourse on activism, particularly in South Africa which has been reported as ‘arguably the protest capital of the world’. Prof Dan Kgwadi, the NWU vice-chancellor, delivered the opening address at the congress. He was accompanied by the executive director responsible for student life, Prof Lumkile Lalendle, and the executive dean of the NWU’s Faculty of Humanities, Prof Marilyn Setlalentoa. Delivering the first of two keynote addresses at the congress, titled “#ThingsMustFall- the Decoloniality option”, was well-known academic and artist, Prof Pitika Ntuli. “While #FeesMustFall can be viewed within a continuum of the anti-apartheid and post-apartheid struggle, this protest movement has brought challenging new dimensions to the repertoires of contention. “This ranges from experimentation with participatory democracy to centering demands for intersectionality which begs the question: ‘have we really critically assessed the nature of protest movements in South Africa?’” said Prof Ntuli during his keynote address. An acclaimed academic, Zulumathabo Zulu, was the second keynote speaker at the conference gala dinner held on 4 July 2017. His talk was titled “Decolonisation: Taxonomy, Epistemology and Technology Underpinnings”. 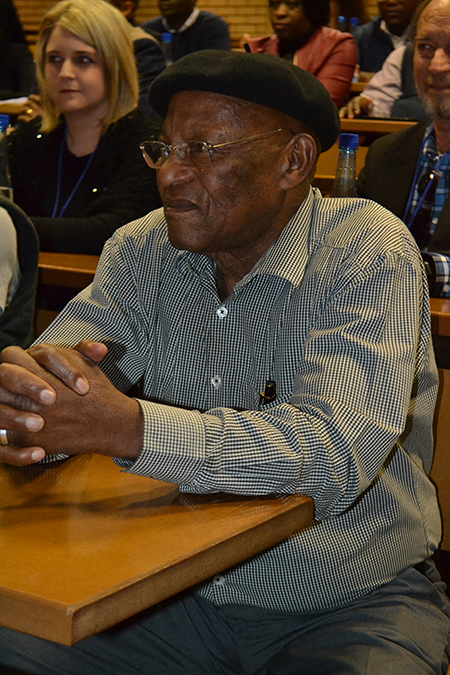 SASA Conference guest speaker, Prof Pitika Ntuli.